The buildings in this photo have been modified but are still standing. The look of the Seneca & Indian Church intersection has changed through the years. 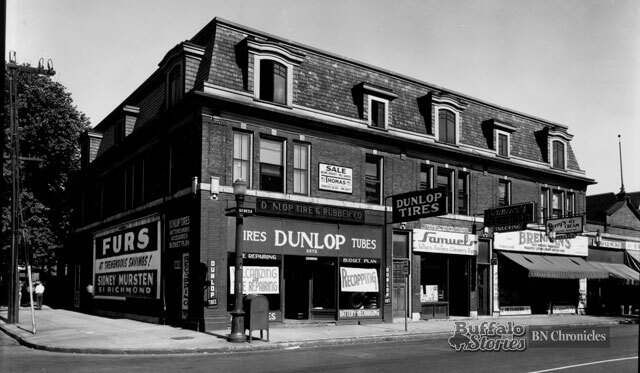 What was the Dunlop Tire store was soon to become Babe Boyce’s. It’s been Hong Kong Kitchen now for decades. Babe Boyce eventually took up several storefronts with bikes and exercise equipment on display in the windows, but when this photo was snapped, David Samuels’ cleaners, William Brennan’s variety store, William Ulmcke’s grocery and Phil Magano’s barber served the needs of South Buffalonians a few blocks north of the city line.